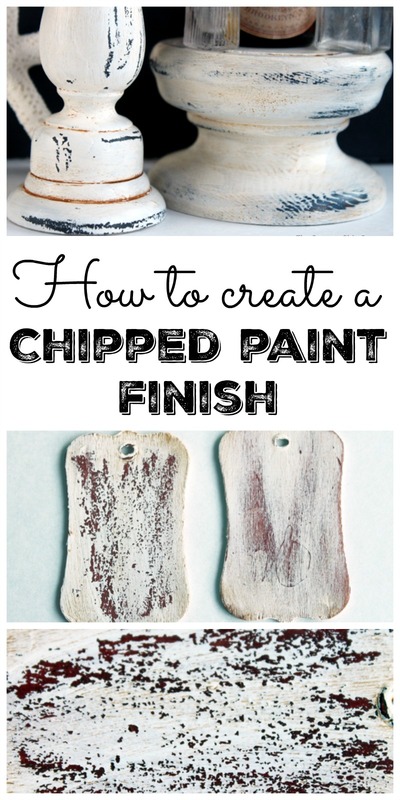 Did you know that you can create a chipped paint finish at home? I am going to give you a technique for creating a lovely, rustic, farmhouse finish on everything from furniture to accessories. The supplies might surprise you but you are certain to get great results from this technique. If you have any old candles around your home, save them! Yep we will be using them as one of our supplies to create a chipped paint finish. Please note that some links in this post may be affiliate links which means a portion of your purchase will go to support this site. 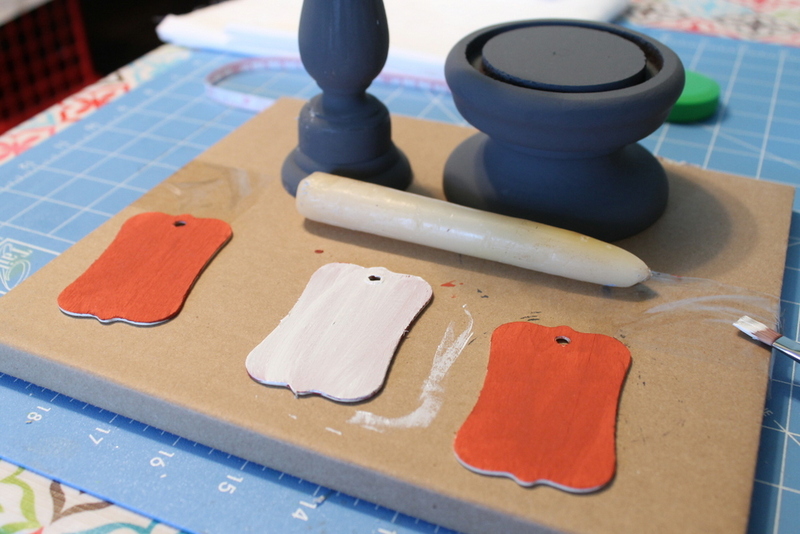 Start with any item that has one coat of paint or give your unfinished pieces a dark coat of paint. This will be your “under coat” and it will show through once we complete this method so pick a color you like. 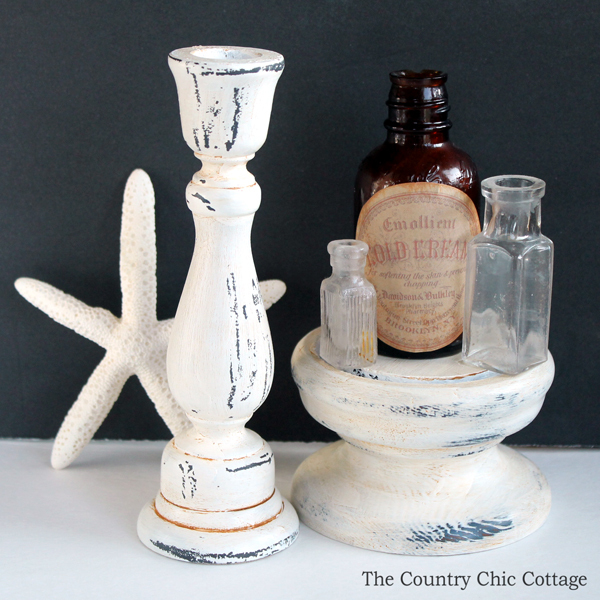 I am using Americana Décor Chalky Finish for these examples but any paint will work. After the under coat is applied and has fully dried (for chalky finish please wait 2 hours), rub a candle all over your project. I told you to save those old candles! This is the secret of how to create a chipped paint finish. 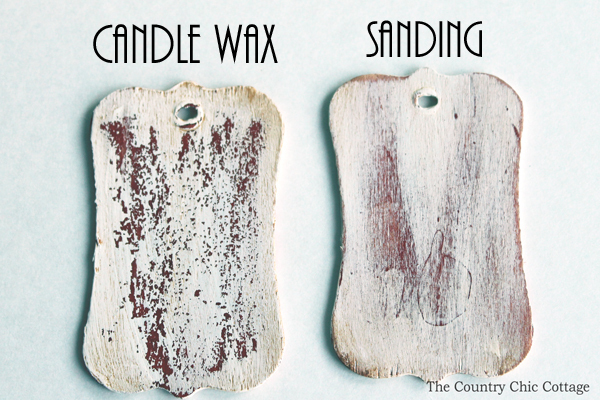 The more candle wax you apply the more rustic the final finish so please keep this in mind. 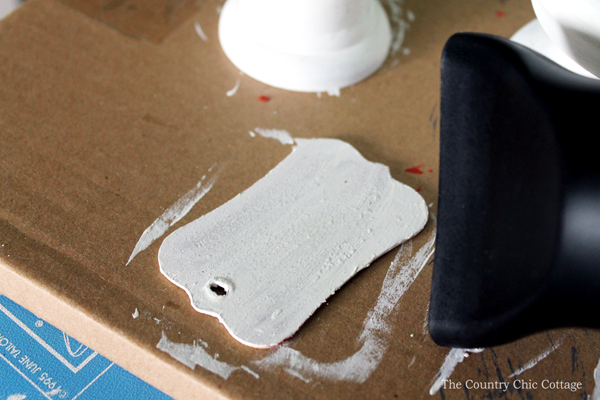 Apply a top coat to your project right over the top of the candle wax. You can apply as many coats here as you desire. It took two coats for me to get the look I wanted on these pieces. Allow to dry again for at least the full amount of time recommended on the package. 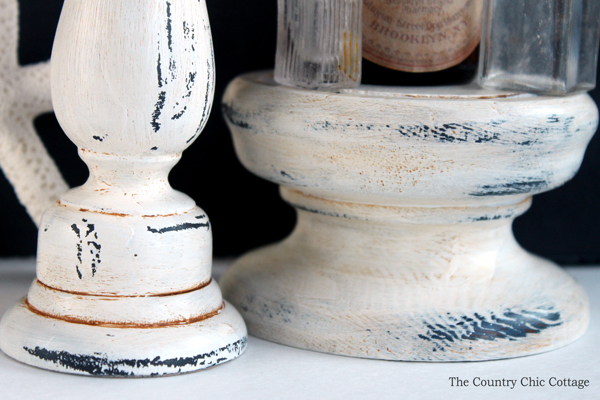 Are you ready to get a chipped paint finish with no sanding and no mess? Grab your blow dryer and heat up your project. You may even start to see some bubbling of the candle wax under the surface of the paint. That is completely normal and will add to the effect. You only need to blow dry your piece for a few minutes. You are just softening that wax under the paint. If you are using this method on furniture, work in small sections with the technique and repeat the steps over and over. You will need a tape with a strong adhesive for this next step. We recommend a duct tape product. Painter’s or masking tape will not work. Stick the tape to the surface, press down, and remove. This can be done quickly as there is no reason to leave the tape on for any amount of time. NOTE: Use a new piece of tape each time. The pieces on the left below have been distressed using this technique. The pieces on the right have no distressing. You can see how the candle wax makes the surface appear that it has chipped off over time. 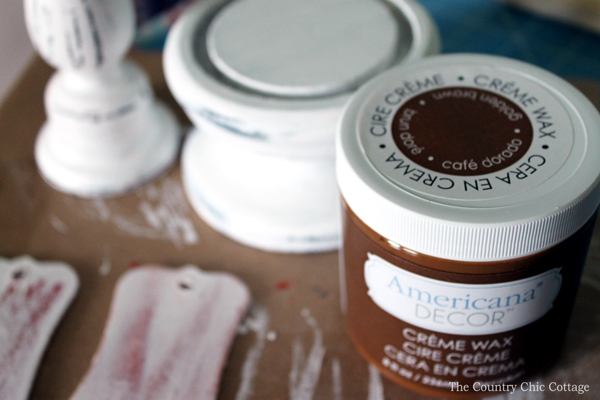 I used a coat of Americana Décor Crème Wax in Golden Brown over my final projects. Just apply then buff off with a cloth according to the package directions. This adds to the rustic feel of this technique. This method requires no sanding. So you have no elbow grease and no mess. It also gives you a completely different look then just sanding along. Below is a comparison shot of distressing with the candle wax method and distressing with sanding alone. You can see the differences in the image below and pick which will look best with any rustic painted projects that you are planning. You can also see the comparison on the image below with a few candle holders. I used candle wax on the one on the left but just sanding on the right version. The looks are very different but both have rustic chippy goodness! 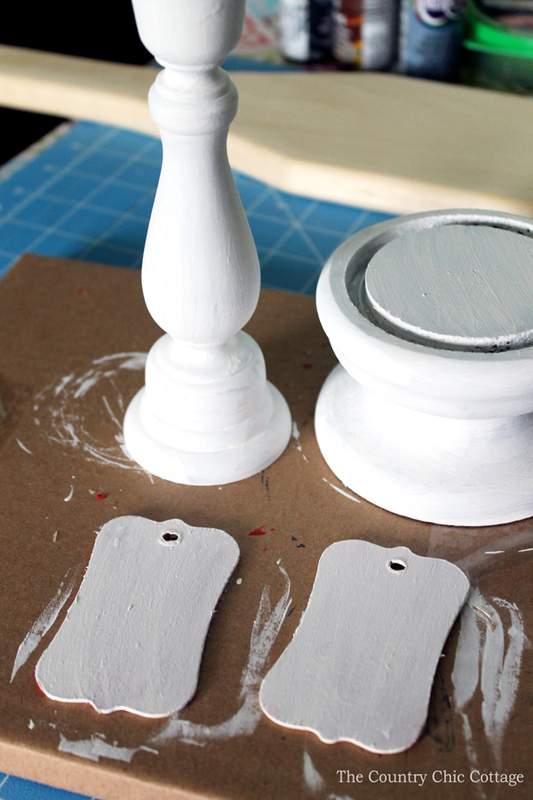 Create a chipped paint finish on your next project with candle wax or just by sanding. Either way, if you are going for a rustic, farmhouse feel, you will want to bookmark this page for reference later. Be sure to come back and report just how your chipped paint projects turn out! We would love to see them! 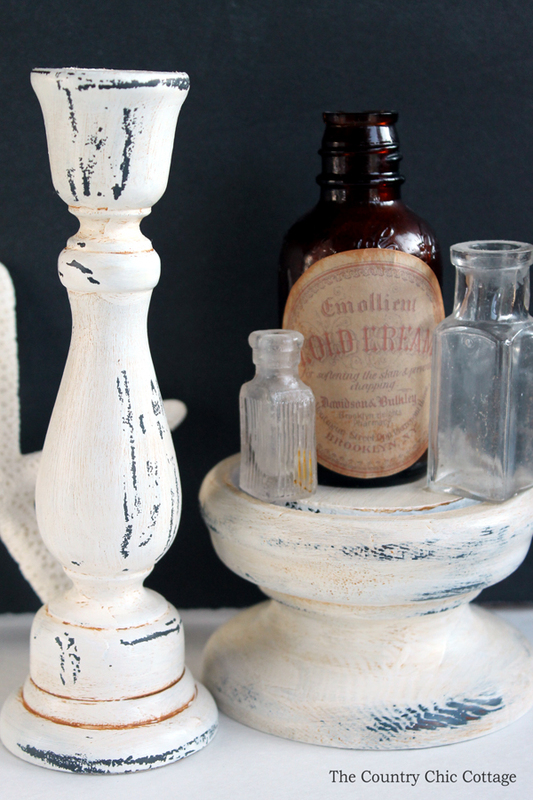 Create a chipped paint finish in your home on a DIY project that you will love for many years. next post: Burlap Wreaths – 12 ideas for every season! 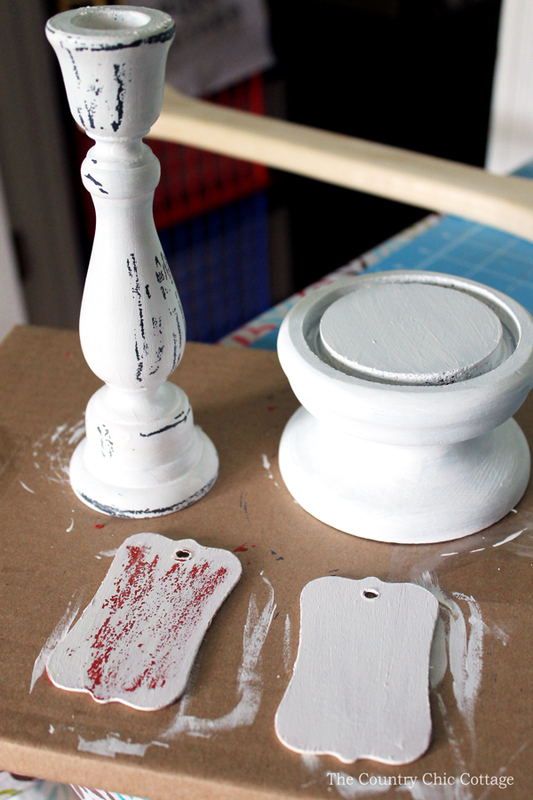 Can I use regular acrylic instead of chalk paint ? Yep! That should work fine! I’m confused– do you use the blow dryer after the last coat and then use the tape to take off paint where you want to have the worn look? I’m not sure where the tape comes in during the process. Use a blow dryer after the last coat has dried. 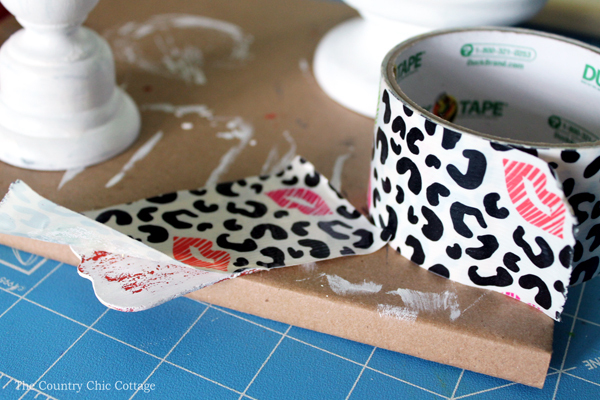 Then use the tape to pull up that paint and softened candle wax. Could you use any type of wax? Does it specifically have to be candle wax? I have not tried any other type so I can’t comment to how it will work!